KOREA: LCD slowdown is affecting LG and Samsung, too | What Hi-Fi? Yesterday I was discussing the effect on Japan's big consumer electronics companies of the global LCD slowdown and oversupply, and what they were doing to tackle the comparative strength of their Korean rivals in this close-fought sector. However, it seems the Korean companies aren't exactly without their own problems, and the two giants in the game, LG Display and Samsung, are also taking measures to minimise their exposure to the woes in the LCD market. 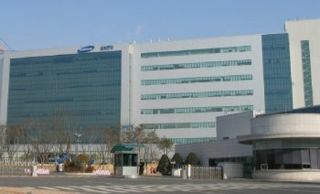 Reports in the Korean press suggest that Samsung's display division (pictured above) is putting in place strategies to tackle low prices, stalling sales and diminishing profits, including putting some of its senior staff on sabbatical or reducing their working hours to part-time status. TV panel output cuts planned? There are even suggestions that the company is looking at cutting output of some of its worst-performing LCD product sectors, such as displays for TV sets. And remember, this is coming from the company that leads the world in LCD TV display shipments – for its own sets, those of customer companies, and its partner in the S-LCD joint venture, Sony. Meanwhile at LG Display's huge plant at Paju (above), originally a joint venture with Philips but since 2008 wholly LG-owned, the building of an extra LCD production line, originally planned for next year, has just been shelved. The company is still investing in its LCD business, according to CEO Kwon Young-soo, but the 3tn won (£1.75bn) it will now put into its LCD division next year is 40% less than it originally planned. It seems times is tough all-round in the LCD TV display business, and the same cut-to-the-bone prices we enjoy when we go telly-shopping could be threatening the continued presence of some very big names in the TV market.